A leading supplier to the aerospace industry has begun benefitting from three new spraybooths installed by STL. Our association with Inflite Engineering actually started more than 20 years ago when we fitted them with a Spraybake booth. But when those installations were reaching the end of their service life at their processing facility Chelmsford, bosses at Inflite knew exactly who to contact. Jeremy Ormes, Aerospace and Industrial Sales Manager for STL, said the new work had actually been in the pipeline for a number of years. He explained: “We first installed an aerospace component booth about five years ago and the plans were always there to upgrade their older booths. “We future-proofed our designs to illustrate where they could go. We have now installed three new booths which all benefit from NADCAP temperature uniformity and prevent pair agitation. 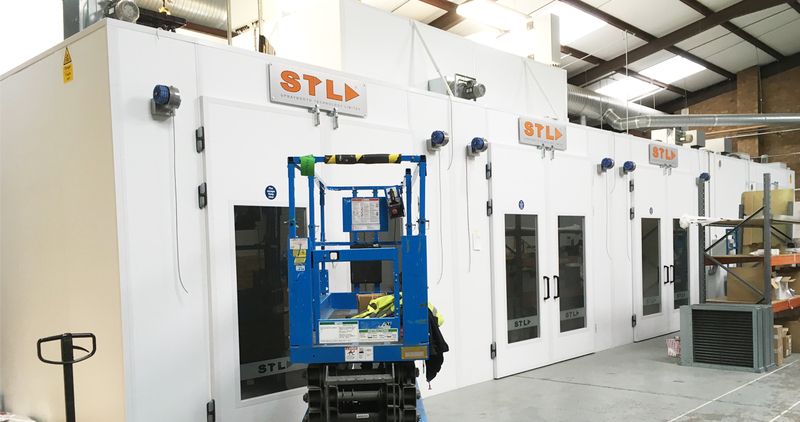 Adrian Yeo, laboratory manager for Inflite, said: “The Spraybake booths were originally installed more than 20 years ago and it seemed a natural progression to turn to STL when we they reached their service life.